11 Light is sown for the righteous, and joy for the upright in heart. This verse tells us several things about God, the believer and the relationship between them. God gives light and joy to the believer in the form of a seed. He can do this because He is Light and He is Joy. He does this moreover in response to the believer's overtures to Him. The believer readies himself for these gifts by being righteous and upright in heart offering these things to the Lord as the prelude to God's generous giving. And because this is a relationship and not a static exchange of gifts each giving calls forth further giving. The more light and joy is sown the more righteousness and uprightness grows. Because the words are familiar to us we readily assume that we understand what they mean in this context. This is not necessarily the case. When Christians think of righteous persons part of the image called up is that of the Pharisees or of the Puritans. A strait-laced, joyless and condemnatory kind of people. The idea of righteous slips very easily into the idea of self-righteous. 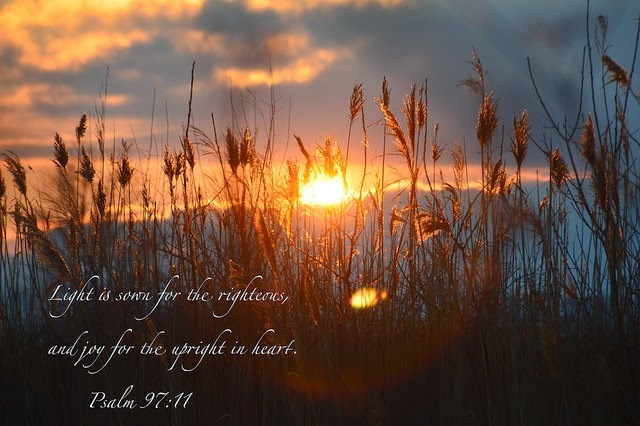 I think that the clue to the psalmists meanings for 'righteous' and 'upright' are to be found in the addition of the words 'in heart.' This is the righteousness of those who recognise the meaning of the prophecy "For I desired mercy, and not sacrifice, and the knowledge of God more than burnt offerings." (Hosea 6:6) The heart-knowledge of God, the God of mercy, is what constitutes righteousness and the deeds that flow from this knowledge are what constitute the right acts that prompt the sower of seeds to plant light and joy. It is a persistent metaphor this use of the idea of 'light' and, again, there is some risk that we take it so much for granted that it becomes somewhat banal to us. I remember when I was being received into the Church the priest, Father John, who was preparing me was fond of illustrating lessons with examples from his Irish boyhood. One anecdote he repeated several times was the experience in rural Ireland in, I suppose, the 1940's leaving a house at night in a place without electricity or street lighting of any kind. The darkness was profound, the way was uncertain and rough and the sudden springing up of light from a torch had a life saving, landscape transforming impact to it that partook of the miraculous. The light of God has, if we allow it to have, such an impact upon our internal landscape. Considering light in the form of a seed is rather more of a mixed metaphor. For Christians, though, it has a meaning which the psalmist would not have considered. "I tell you, unless a grain of wheat falls to the ground and dies, it remains only a single seed. But if it dies, it produces many seeds." (John 12:24) The seed of light which God sows in the heart of the believer is the Lamb that was slain and is now alive. He sows Himself, He is the Light and when He is sown He becomes our righteousness, our uprightness. This is the reciprocal arrangement, the more He grows within us the more light we become and the more seed is sown. Beyond a certain point all multiplicity is resolved into unity and so light and joy become the same thing because they come from the same source. In this life here below though it is but seldom, if ever, that we experience this blessed union in God, through God because of God. So it is worth considering joy in its independent aspect as we can experience it here and now in the gift of it that the Father through the Son in the power of the Holy Spirit gives us. Because it is a hidden gift it is a deep joy, a joy that forms a permanent underlayer to everything that we do and are waking and sleeping, unless, that is, we kill grace in our soul by committing acts of mortal sin. This kind of joy is about more than laughter and wine and good times though it certainly can include these things. It is a manifestation of the theological virtue of hope and a banishing of despair. When my parents died I was possessed by grief, my sorrow was beyond the power of my words to describe. Yet throughout those times I was never dispossessed of joy. Because the seeds within remained within and did not cease to be tokens of the Divine Presence I never ceased to be in communion with Him. I may not have felt that communion, He may not have sent me tokens of His presence but He was present and that made a difference and that was the joy that did not depart even in the presence of suffering and loss. 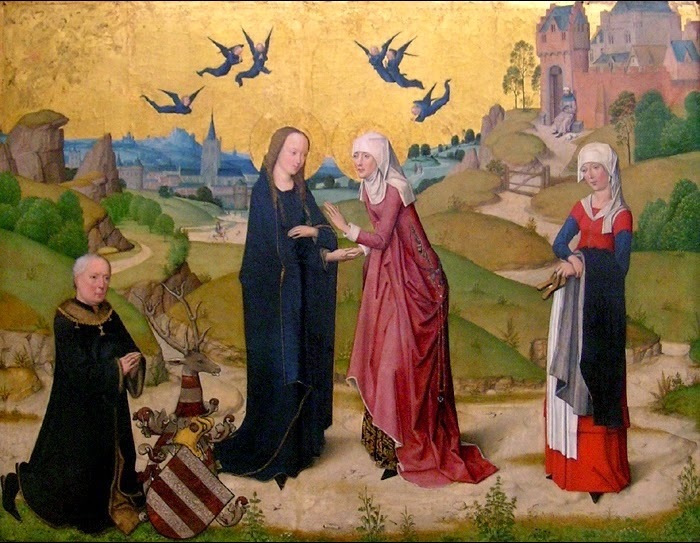 Perhaps the most perfect illustration of this psalm verse can be found in the person of the Blessed Virgin Mary at the time of the Annunciation. Light and joy were sown in her by the words of the Archangel Gabriel and by her glad and free consent to them. And then Light Himself and Joyfulness Himself became literally the seed within her womb, a womb which contained Him whom heaven itself could not contain. And these things were sown in her because she above all other creatures of God was righteous and upright in heart. In her is our model, through her came our salvation, who can resist saying with the angel Hail Mary, full of grace? This is a very lovely blog, and is probably one of your best attempts at explaining why on earth anybody would want to be a Catholic (or very intensely devoted to another religious faith).